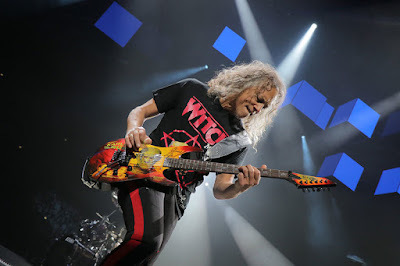 Metallica performed their 1984 classic, “For Whom The Bell Tolls”, at Jyske Bank Boxen in Herning, Denmark on March 27, and the band are sharing professional footage from the event. The tune was the second single from the group’s second album, “Ride The Lightning”, which peaked at No. 48 on the Billboard 200 on its way to US sales of more than 6 million copies. The Herning show marked Metallica’s return to live action following a 6-week break from the road as they continue a spring trek across Europe that runs into early May. Metallica will bring their 2018 arena show in support of "Hardwired… To Self-Destruct" to North America this fall. The metal icons have announced a new ticket package that will allow fans to attend multiple dates. “If you love to travel and one show just isn't enough, then perhaps the Wherever I May Roam Black Ticket is for you!,” explains the group. “For the first time in 'Tallica history, you may purchase one ticket that will allow you floor access to any Metallica show on the 2018/2019 North American tour. Feel like trucking to Tulsa? Booking to Boise? Motoring to Minneapolis?